Stamped Sophisticates: Berry Burst Valentine using Bloomin' Heart Thinlit from Stampin' Up! Berry Burst Valentine using Bloomin' Heart Thinlit from Stampin' Up! I can't seem to stop using the Bloomin' Heart die. Here's yet another Valentine Card that works for Valentines, but this card could easily be used for a Wedding or Anniversary card with a simple change of sentiment. The sentiment is from the very popular Petal Palette set, from the Stampin' Up! Occasion catalog, which includes not only this sentiment, but a Congratulation, Thank You, and Best Wishes sentiment making this a go-to set for useful sentiments in addition to the wonderful images in that set. The Bloomin' Heart die set is in the main catalog. The basecard is Berry Burst, then a layer of Whisper White, and then a layer of Pink Pirouette, The large heart is cut using the Blooming Heart Thinlit die with Whisper White Hearts. The smaller White Whisper White and Pink Pirouette heart are cut using the Sweet & Sassy Framelits. I strongly recommend using the Precision Base Plate with this thinlit. You'll also want to use the Die Brush to easily remove the chads on this detailed die. The sentiment banner is stamped with Beery Burst ink using a sentiment from Petal Palette. The banner and the flowers include a Gold Metallic Enamel dot accent. This card is a perfect card for a special Valentine. Join us for the General cards and Valentines class scheduled for February 11, 2018. We'll make a variety of cards and gifts pictured below. You'll love having these gift items, and general cards on hand ready for when you need a teacher gift or a small thank-you gift. .
We'll make four full-size cards, four treat packages, and a gift card using the Stampin' Up! narrow note cards with matching envelopes. Class size is limited, so register for this class now. Your class fee of $30 will include precut materials and candy and gifts to fill your treat packages. 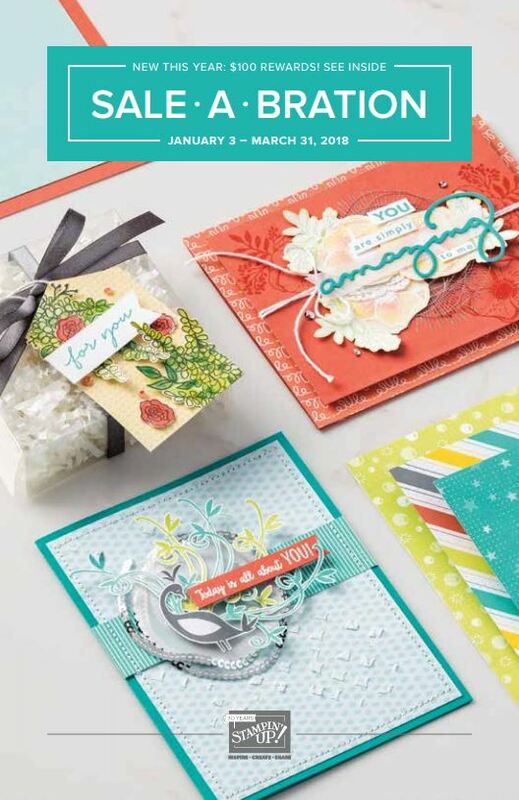 Download free copies of the current Stampin' Up Catalogs. Get both the Occasions catalog or the Sale-A-Bration Catalog, click here. The Sale-A-Bration tab on my blog shows you how to earn free gifts during Sale-A-Bration. Download a free Stampin' Up! t Sale-A-Bration brochure to see gifts you qualify for.